ilker was born in 1981. The word “ilker” means “the first warrior” and honestly, ilker is the first and only male child in his family. İlker married with Aslı in 2012.Once upon a time, ilker found himself at the gates of a university in istanbul. After spending 5 years at the university, he graduated and got his first job as graphics designer at “Enerji Fuarcılık Basılı Yayıncılık Matbaacılık”. ilker worked at that company for 2 years and then quit to fulfill his military service. 6 months later, he returned back to istanbul and started working at “REPAR” agency. 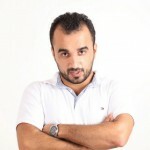 He worked at REPAR until the 2013 as graphics designer. After 8 years experience of agency, he’s working at MT Displays (Turkey’s biggest display equipment manufacturer and more) . Photography is the most important hobby for ilker. He bought his first camera in 2005, a CANON PowerShot S3 IS. After 2 years, he upgraded to a true DSLR, a Canon EOS 20D with a couple of lenses and various accessories. İlker also enjoys tech, tracking, swimming, paintball and extreme sports like pragliding and rafting. I really like your blog but i think that you would get more people if you optimized better, idk if you have heard of this program but its very helpfull if you want to bring more traffic to your website. It tells you what you need to improve on your blog posts to help google rank your pages better. I posted the link im the website field. let me know what you think maybe i can help you out. can u write ur equipment camera and lens? Luigi yes im working in agency of repar. We extremely appreciate your site post. You will find so many approaches we could put it to really good use by means of a minimum of effort in time and resources. Thank you really regarding helping have the post answer many concerns we have come across before now. My programmer is trying to persuade me to move to .net from PHP. I have always disliked the idea because of the costs. But he’s tryiong none the less. I’ve been using WordPress on a number of websites for about a year and am anxious about switching to another platform. I have heard great things about blogengine.net. Is there a way I can transfer all my wordpress content into it? Any help would be really appreciated!